If you hadn't already seen plastered all over my social media, it was recently my best friend Charlotte's birthday so what better way to celebrate than with her favourite thing - chocolate orange! I really enjoy baking (although it's not so much fun when 1. I'm doing it on my own and 2. I'm on a diet), and wanted to give something new a go. My Chocolate Orange Shortbread recipe went down really well and a couple of people even tried it themselves which makes me super proud and that squirmy type of happy so hopefully everyone likes this recipe just as much! 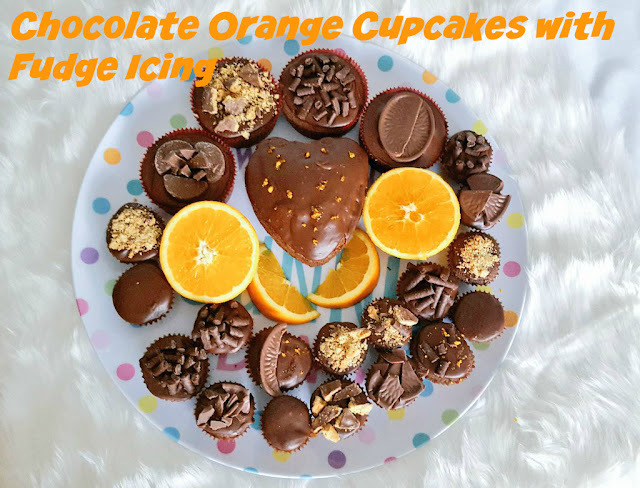 Obviously I'm biased about all my baking, or maybe just sweet things in general, but these Chocolate Orange Cupcakes were amazing so I wanted to share the recipe with you all after having quite a few requests on Twitter! They're really easy to make, literally anyone could do it. Don't forget decorations! I literally bought everything chocolate orange I could find - matchmakers, terry's chocolate orange (big ones and segments), and I even found chocolate orange digestives, which can I say is the best invention ever!! Leave on a rack to cool completely before decorating - this is always a step I get so lazy about because I get too excited but trust me trying to put icing on a warm cake will ruin it! Melt the butter in a saucepan and then sift in the icing sugar and cocoa powder. The consistency shouldn't be so thick that you can't spread it on the cake but also not so runny that it runs off. I kept adding more squeezed orange juice until I got mine to the right consistency but it's personal preference on how thick you want it! Decorate and ENJOY... remember when it comes to cakes, sharing isn't caring, sharing is silly. Whilst icing the cakes, you may find the icing starts to set in the saucepan so give it a stir. If it's still stiff put it on the heat for about 5 seconds stirring it around and it'll loosen up. So these cakes literally couldn't be easier, I think the hardest part is trying not to eat them as you go along.